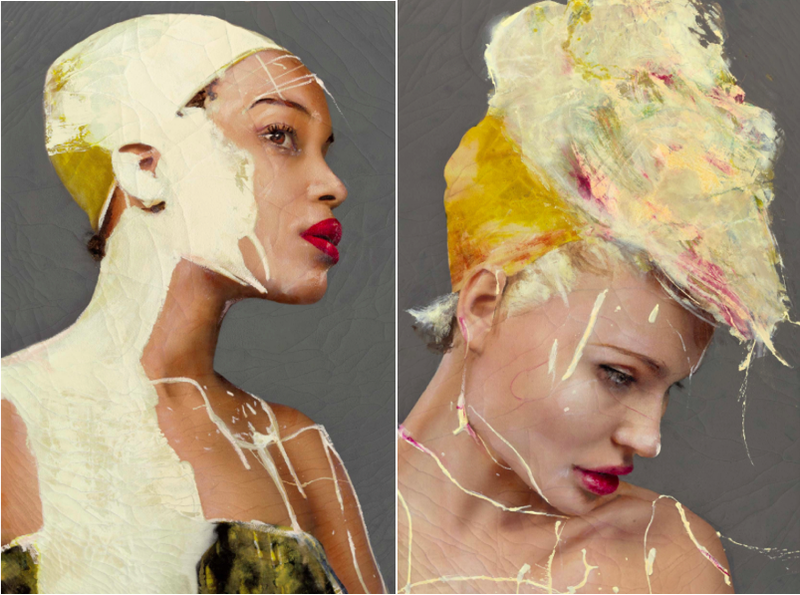 Two concepts spring to mind when engaging with Lita Cabellut’s work. The first, Beauty, is a burdened one both within and outside the context of fine art. The second, Sublime, has become an instinctive counter-reaction to declarations of beauty, provoked by Edmund Burke’s seminal in 1757 ‘Enquiry into the Origin of Our Ideas of the Sublime and the Beautiful’, which illustrates the psychological factors that cause man to react to these two rigidly distinct sensations. and yet are often relegated to the purgatory of contemporary artistic discourse. Studying Cabellut’s expressive portraits, the impact of their size versus the vulnerability of the cracked canvas; the sheer magnitude of her female subjects versus a suspicion in their gaze, strikes me as an elegant paradox of aesthetic philosophies. art and philosophy. Reclaimed by contemporary philosophers such as Alexander Nehamas in his encouraging book ‘Only a Promise of Happiness’, Beauty has recently been resurrected and reconnected to the value of art. The beauty in Cabellut’s portraits manifest a hope that can shape and direct our perceptions. Offering much more than a superficial spectacle, there is a misery in the pursuit of these women. A tantalizing promise of happiness that urges us to pursue and understand. Impulse brings into question the dichotomy between these two giants. The violence is subtle and contained, seducing the viewer in its disguise of full lips and saturated colour. The viewer approaches, enchanted, until a moment of realization releases a duality of emotional response between attraction and repulsion; fascination and compassion. Here we encroach into the causal structure of Burkian sublime; evoked by the presence of the violent, contained by the principles of beauty. The sublime surpasses simple beauty but holds us safe within the boundaries of human experience. The sublime allows us to experience the highest forms of life by presenting ugliness, deterioration and deathliness; reminding us that to appreciate true pleasure and beauty is to experience true pain and decay. The act of aestheticising violence has long been a method of evoking the experience of the sublime in art. Where mass media often uses sensationalism to turn violent representations into objects of fascination, fine art aestheticizes the menacing as a way to humanize its experience. In her deconstruction of traditional concepts of Beauty and their relationship to violence, Cabellut examines our inherent impulse towards the duality of these sensations. These women, like the artwork they are contained in, are objects of beauty to be admired and possessed. Yet the expressions on each of their faces reveal a submission to the violence behind the gaze, the act of possession implicit in the enjoyment of their physical loveliness. They avert their eyes from our penetrating stare – knowing, restrained, on the brink of an impulsive act. Posted in art and tagged art, beauty, emotion, exhibition, london, opera gallery, sublime, violence. Bookmark the permalink. The 60’s SS16 Trend – Not Then, but Now.